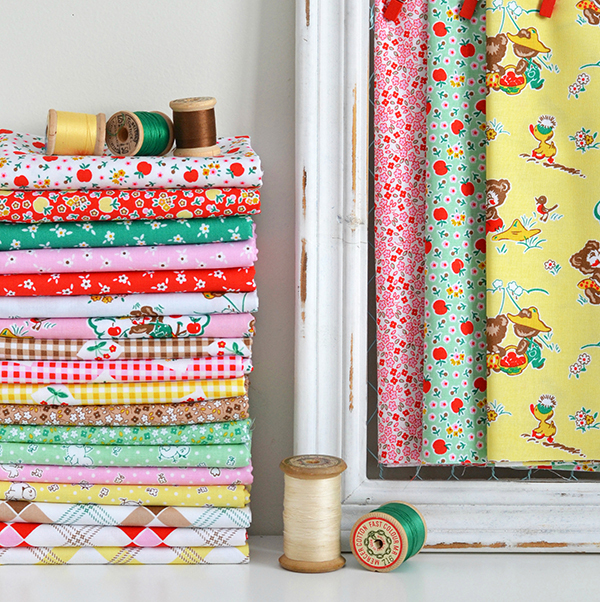 It's my turn on the Penny Rose Fabrics Project Design Team and for the project I am sharing today I picked Elea Lutz' latest line, Apple Farm (which will be in stores any day now!) I love Elea's fabrics and this collection didn't disappoint, in fact it may well be my favourite to date. Cutest farm scenes in these prints - did you spot the duck with the fluffy pompom hat?! Instant naww factor there. 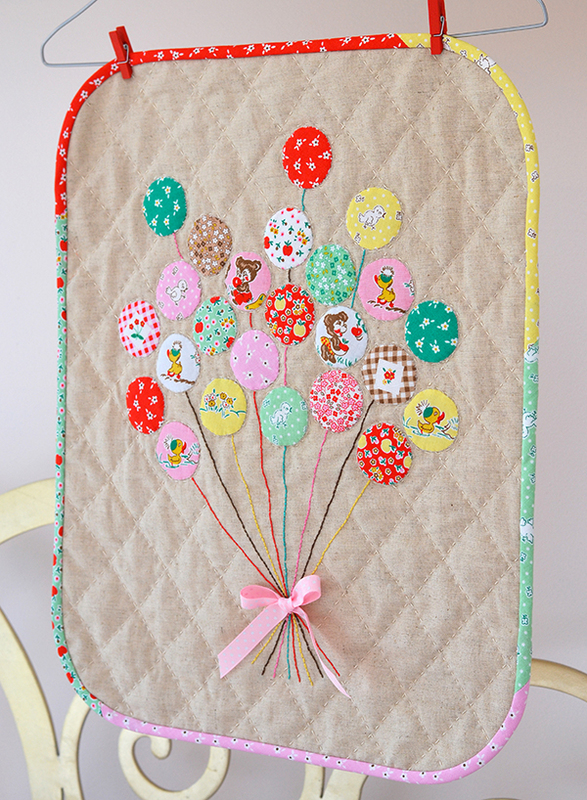 And this is what I created: a balloon mini quilt - a little touch of childhood whimsy. 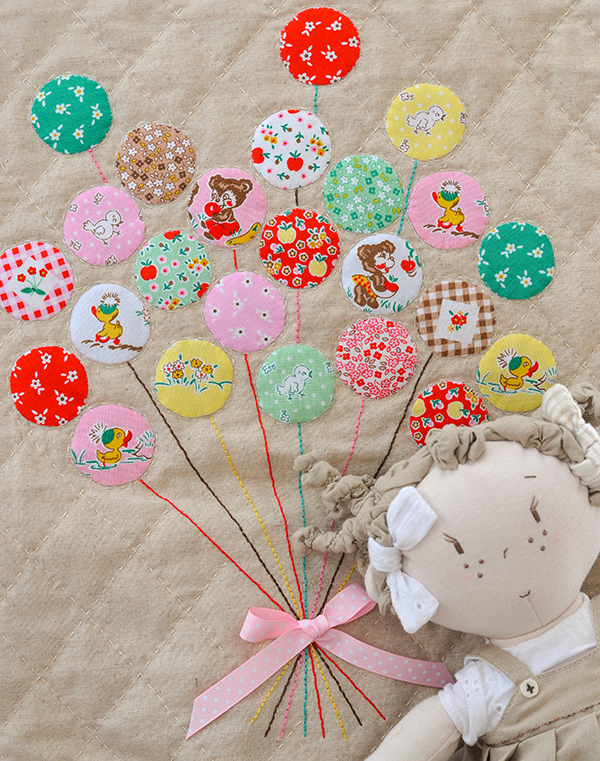 The 1.5" diameter balloons are applique backed with non-fusible lightweight interfacing. 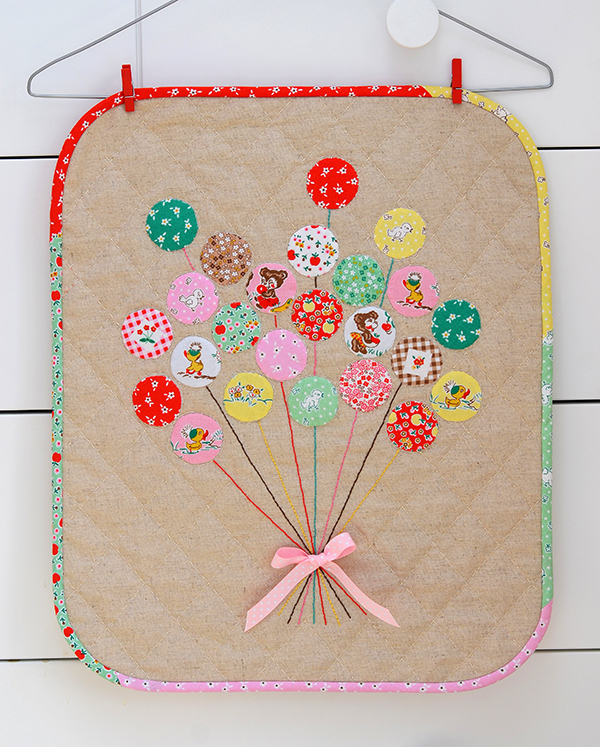 I hand embroidered the balloon strings using back stitch with 4 strands of cotton floss, and hand-quilted the mini in a criss-cross pattern, with circular hand-quilting around each balloon to make them pop. As my wrists have been playing up lately I cheated a little and appliqued the balloons with my sewing machine, set to a really tiny applique stitch, so the stitches are barely visible. This mini is really a 'repro' quilt as the inspiration for it came from this vintage quilt, circa 1930s, maker unknown. Isn't it incredible? 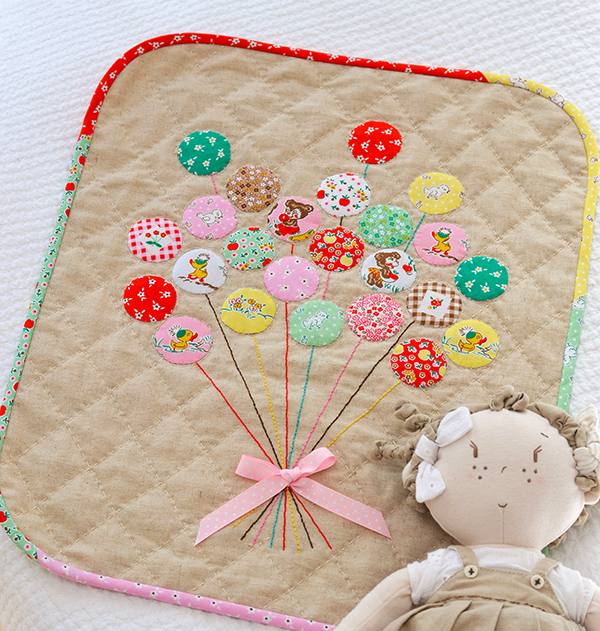 There is a crazy amount of hand-sewing there, both in the applique balloons and the hand-quilting - it's hard not to respect the person who created this piece of art, and no doubt much love went into each and every stitch. Penny Rose Fabrics specialise in vintage and reproduction fabrics - so I thought in keeping with that mission statement it would be nice to recreate this vintage quilt using modern repro fabrics. I didn't quite have the wrist strength or stamina to make the full size version - so I had to contend with a mini. I hope you like it - Alice's doll seems to! Sedef this mini is absolutely adorable!!! 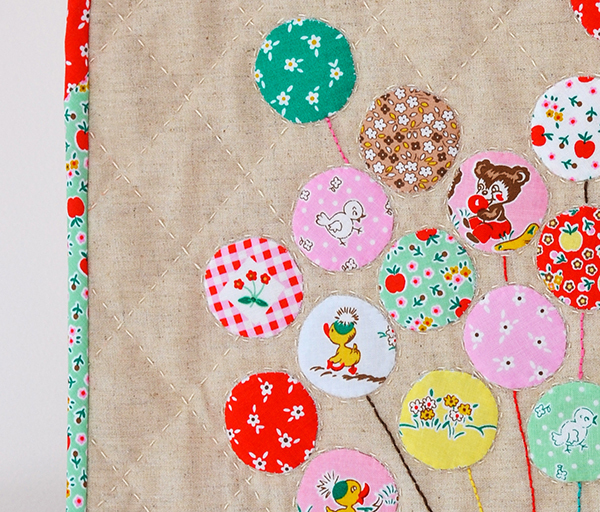 Each little balloon is so sweet and so much detail with hand stitching. Just love it! What a beautiful mini and I love how it displays the print fabrics. Hope your wrist gets better :)! Oh my goodness, Sedef, this is so cute. 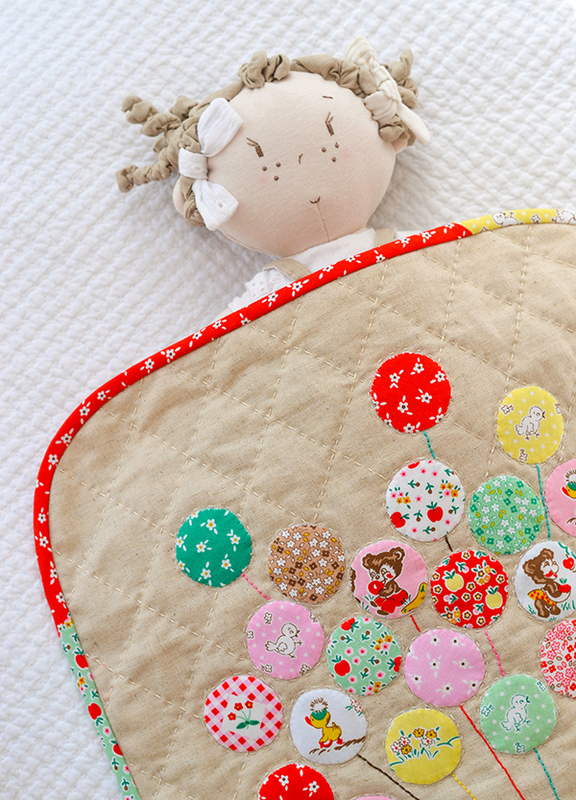 I love Elea Lutz fabric and you made a treasure!! 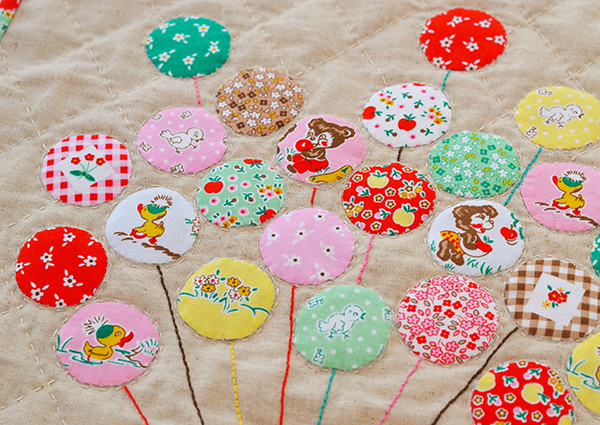 This fabric collection is just adorable. I love your project too. It's a tiny version of what I had envisioned to put on my first child's walls in his nursery before he was born. Back then I had run across some primary colored fur circles and thought they would make perfect balloons on his wall along with something for the strings. I couldn't decide if I wanted some ribbons or paint, although I knew ribbons wouldn't be safe so I had decided on paint. Sadly, I had some problems with my pregnancy that put me into bed for the last 5 months of the pregnancy so he got a crib and changing table for decoration for the most part. LOL Oh well, plans don't always go as planned. Anyway, when I saw your project, that took me back a lot of years because it reminded me of that. Sorry for rambling. I think you did a great job using the machine. I can't do hand stitching at all so I can feel your frustration in not being able to do what you wanted with the hand stitching. I think it looks great though! Oh my gosh this is so precious!!! You really highlighted the prints with the wee balloons. You are so creative and talented, love your blog! This is just adorable! You make very pretty balloons! I'm just now seeing this, brought here by a more recent post someone had linked on their blog. I have some 10" squares of this fabric line and think this would make a wonderful baby or child's quilt. So happy!!! I find your blog intriguing. Your projects are so lovely. I may just try this, but I would put a modern twist on it, by using SoftFuse for the balloons and making them a bit larger, so few bunches of them. I can't face doing the hand stitching, so I would also try couching for the balloon strings rather than all that hand embroidery. I've been trying to come up with a quilt pattern for years that would be perfect for a Robin Eggs Blue background and I think this would have to be it! Thank you so much for posting this lovely mini & the link to the vintage circa 1930's original. I need to go now to my fabric stash and see if I think R.E.Blue would work with this line. Pixie Noel Blog Hop: Xmas Tree Cushion!